Daily service, for example, shows you leaving Chicago at 1PM on Sunday, arriving at the Gallatin Gateway – the entrance to Yellowstone Park – at 1:57PM on Monday, and arriving at Seattle on Tuesday, at 7:55AM. A reverse movement of the train, with the rounded observation car hooked to the engine, was dragged down to Tacoma, arriving two hours later at 9AM. In this setup, the train was correctly aligned to head back to Chicago, making a left turn at Black River Junction (See Halloween entry) heading for the high Cascades. Once you arrived at Seattle, you had connecting service to Everett – via a Greyhound Bus! And, if you detrained in Tacoma, you had connecting service to Aberdeen, yuppers, via a Greyhound Bus! Have times changed? When’s the last time you saw a Greyhound bus on the Interstate? I remember back in the late ’60’s, driving between Seattle and Portland, on the fairly new I-5 (still under warrantee!) being overtaken and aggressively passed by the Hounds! 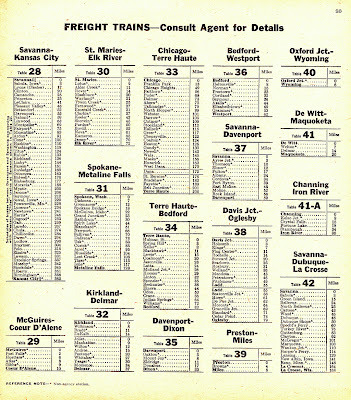 All kinds of promotional services are found within the pages of a passenger timetable. 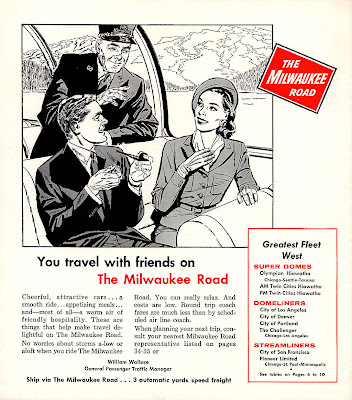 Including a note about the availability of deck of Milwaukee Road playing cards, in two colors, at 45 cents per package! 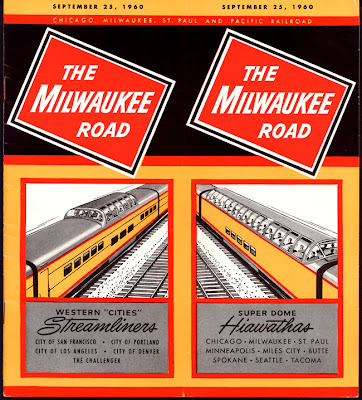 An unusual feature of the Milwaukee Road passenger timetable was a complete listing of freight train routes, in the back of the schedule. And what a travel bargain! One way, Chicago to Seattle coach seat plus a lower berth, $103.67. You know, it is a shame what has happened to US rail travel. One only has to go to Europe to see what we could have been. 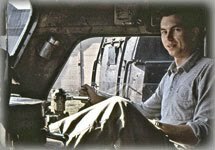 The late David P. Morgan wrote an agonizing appraisal in a late ‘60’s Trains Magazine editorial, “Who Shot the Passenger Train?” Corporate hunger for money shot the passenger train. Who ever heard of such nonsense as varnish hitting the hole for a freight train? $103 "1960" dollars works out to about $800 in 2011 (US) dollars. I'm not sure but I think an AMTRAK seat and roomette can be had for less at the current discounted rates (if you hit a low bucket).